This year's event held June 25 - July 5 at Jericho Tennis Club, Vancouver Lawn, and Burnaby Tennis Club. 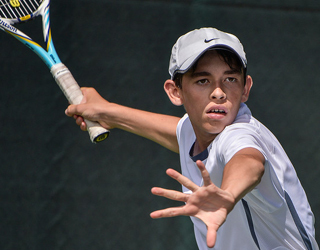 Benjamin Sigouin, above, was able to skip his own age group, the Boys' 14, to play up in two age categories, the Boys' 16 and the Boys' 18 as the format for this year changed to separate the age categories. Benjamin went on to win both singles and doubles events in the Boys' 16 as well as the Boys' 18 .Singles - 5-8 Playoff, and the Boys' 18 Doubles - an impressive achievement for a player who just turned fourteen. Photo 1: From left to right: Cassie Chung, Khadija Dumas Da- Silva, Rosie Johanson and Alex Sigouin. Rosie outlasted her double partner, Daniella Silva, in the Girls' 18 Singles, 6-7, 6-4, 6-1. Later, they beat Cassie and Khadija, 6-1, 6-2, in the Doubles' final. Khadija also was the runner-up in the Girls' 16 Singles, losing to Stacey Fung in the final. Photo 2: Alexander Day came back, set down, to beat Kyryll Kryvchun, 4-6, 6-3, 6-1, in the Boys' 18 Singles final. Alexander and Benjamin Sigouin had a walk- over against Daniel Raw and Kyryll in the Boys' 18 Doubles final. Photo 3: From left to right, Kiran Phaterpekar, Benjamin Sigouin, and Neel Phaterpekar. Benjamin and Neel teamed up to outplay Manroop Gill and Ben Kirsh, 6-1, 6-0, in the Boys' 16 Doubles final. Photo 4: Jack Davisi overcame Kiran in the Boys' 14 Singles final, 6-2, 5-7, 6-2. Photo 5: Brandon Fung and his sister Stacey Fung. Photo 6: Jessie Gong beat Nina Erdevicki, 6-7, 6-4, 6-2 for the Girls' 14 Singles crown . Twenty nine players were competing in the Boys' 10 category. Photo 7: Felix Fan lost to Kyryll, 7-5, 7-6, in the Boys' 18 Singles semis.